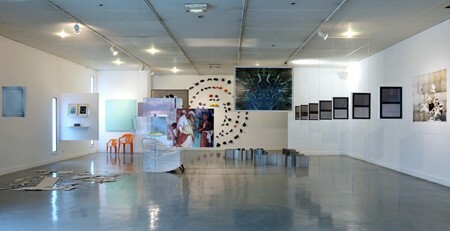 Installation view of Perspective, 2009, from the exhibition series A Simple Plan, at La Maison Populaire in Montreuil, Paris, France. From left to right, artworks by: Gaël Pollin, Gwenneth Boelens, Barbara Bloom, Etienne Bossut, Caroline Boucher, Matthias Bitzer, Gaël Pollin, Jérémie Gindre, Cécile Desvignes, Michel François, Isabelle Cornaro, Adam Putnam, Gwenneth Boelens. Photo by Aurélien Mole. In the following interview, the emerging curator Emilie Villez discusses the formation and recent work of the Parisian curatorial collective Le Bureau/, and about the burgeoning French Association for Curators that she was instrumental in forming with other colleagues in the field. Aside from being active in those two organizations, Emilie writes, curates independently, and works at Kadist Art Foundation in Paris. SOFIA: If I remember correctly from an earlier conversation about Le Bureau/, you mentioned it was formed during your school years—the seven members that are part of Le Bureau/ were assigned in class to jointly organize an exhibition. Can you tell me more about the group’s formation, the curatorial program who were enrolled in, and the decision to keep working together post-graduation? After graduating, we decided to figure out something together. We thought it was difficult to start out as an independent curator, and that it was more exciting to be involved in a collective discussion about exhibition making. It also seemed like an interesting statement, when everyone was arguing about the idea of the curator as author. During a period of over two years, we engaged in a very rigorous discussion routine, meeting once every week to sketch projects and discuss them. At first, these projects were merely virtual; then we started realizing them, collaborating with places like Bétonsalon in Paris. Our group identity was always something surprising for others. SOFIA: Your current exhibition, Perspective, is conceptually and physically modeled after a “picture box,” what you refer to as a defined field of vision. Can you talk about the discussions that helped pin down this concept—seven people deciding on it, wow!—and about the selection process to decide on artists and artworks? EMILIE: Of course, seven people do not have the same tastes or desires in art, nor the same understanding of one given project! We have always based our work on being driven from our seven subjective viewpoints, which has often been purposefully affirmed as a way to show the multiple aspects of artworks and keep interpretation as open as possible. That is why we rarely work according to a theme, but rather from a protocol or work method from which several themes or ideas can spring. This exhibition is one of several we are making for La Maison Populaire, located in the Paris suburb of Montreuil, where Le Bureau/ is curator-in-residence this year. We will curate three shows there, and publish a book under the general title Un Plan Simple (A Simple Plan). The ideas and discussion that followed started with the actual gallery space of La Maison Populaire—the gallery is situated in an area leading to a larger cultural center offering various courses like dance or music classes. Both entities are connected and yet have separate programming philosophies. Some people come twice a week for a class and will barely notice the exhibition, while another audience comes solely to see the exhibitions. In thinking about that context, we were interested in the idea that an exhibition can be perceived as a flat image — related to what you see or remember when you just pass by, the exhibition becoming a mere background — what it eventually becomes when it is archived with photography. From there, we talked a lot about the way artworks are constructed, and how an exhibition could be constructed the same way. We narrowed down three very general and obvious cultural paradigms: perspective, stage, screen. A strong scenography will illustrate all of the three, while the artists or works are chosen less literally. In terms of the selection process of artists and artworks, each of us always make individual suggestions and discuss these with the group. In the process, many choices and ideas are in a way re-appropriated. These subjective choices often generate surprising combinations due to our different tastes and interests. In Perspective, the first exhibition of A Simple Plan, the artworks are integrated in the space according to a specific viewpoint to form an image. You see this general image first; then you can circulate among the works, inside the image. I think the exhibition actually looks like a collage in the end. SOFIA: What are the working dynamics of the group—that is, does it resemble a roving micro-institution, wherein each team member is devoted to an aspect of the project, e.g. someone conducts studio visits, another does press, someone else takes care of public programming and education, etcetera. EMILIE: I don’t think we work like a micro-institution. The work is organized, but the organization is never fixed. Maybe that’s why we never decided to have our own space. We all have jobs, so, according to each project, we try to distribute the work into smaller teams of two people. Our roles also vary in function of the institutions we work with, which also work differently from one to the other. In any case, discussion takes more time, and so does writing. There are generally three people assigned to write a text (even a press release), but it is read and re-read by all seven of us! SOFIA: A group of artists in New York recently formed W.A.G.E., which stands for Working Artists and the Greater Economy. They intend to raise awareness about the lack of fees devoted to artists, independent curators and other freelancers in the art field, particularly in New York. They’re hoping to organize the arts community, and are proposing to set standard agreements, fees and the like. You are part of a similar albeit more structured group of independent curators in France who are lobbying for fiscal rights and matters regarding the livelihood of your profession. Can you talk about it a bit? EMILIE: I participated in the creation of the organization C-E-A, the French Association for Curators, because of the paradox around this profession, which is obviously recognized: the curator is more and more visible as an essential figure of the artworld, more and more academic programs are breeding new curators every year, and yet there is no administrative structure in place to support the practice. For example, people and institutions do not know how (meaning, under what status) to pay curators they hire for short-term basis. The mission of C-E-A is to work on concrete ways to support the profession of curators, for example, through the creation of grants, offering legal counseling, etcetera.